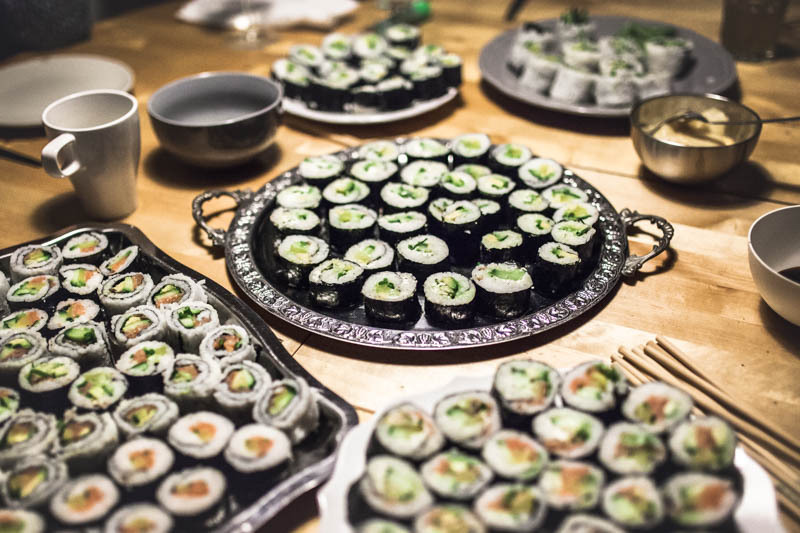 Last weekend I hosted a sushi party at a friends place. We were a semi large group of 10 people – all severe sushi lovers and big eaters. 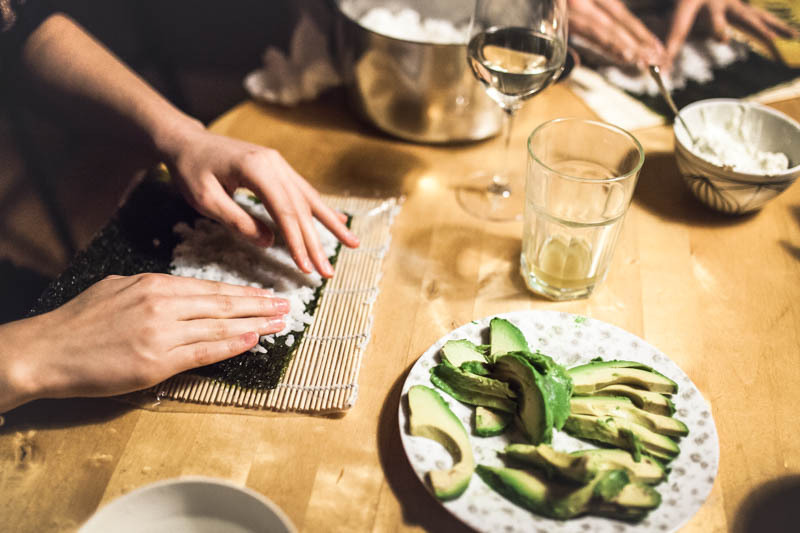 Since the party was a big success I’d like to give you some advice on how to host a sushi party for many people without breaking into sweat as well as giving you creative and traditional sushi filling ideas. At first appearance hosting a sushi party seems like a rather elaborate, complex and possibly overcharging affair. How much rice do you need? How do you cook sushi rice? What ingredients should you buy and how many? 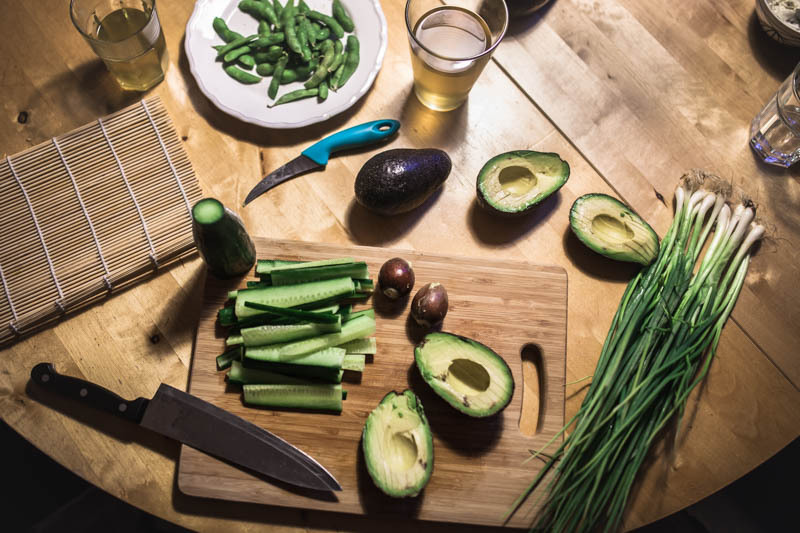 What sushi tools do you need? What do you need to prepare in advance? How much sushi rice per person? 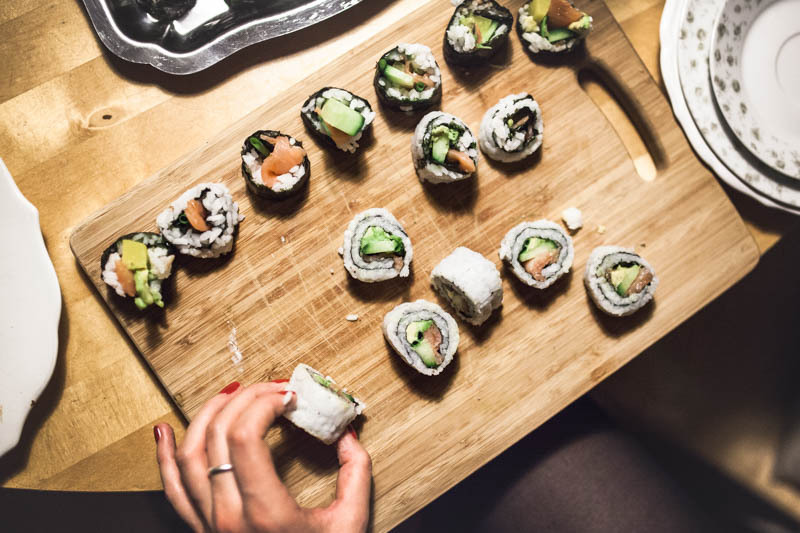 Worry not – I’ve got you covered with everything you need to know to throw a sushi party that leaves your guests flabbergasted and in a sweet food coma. If possible do your groceries a day in advance. It’ll reduce the stress and in case you couldn’t get a certain ingredient you can still change plans or look somewhere else. 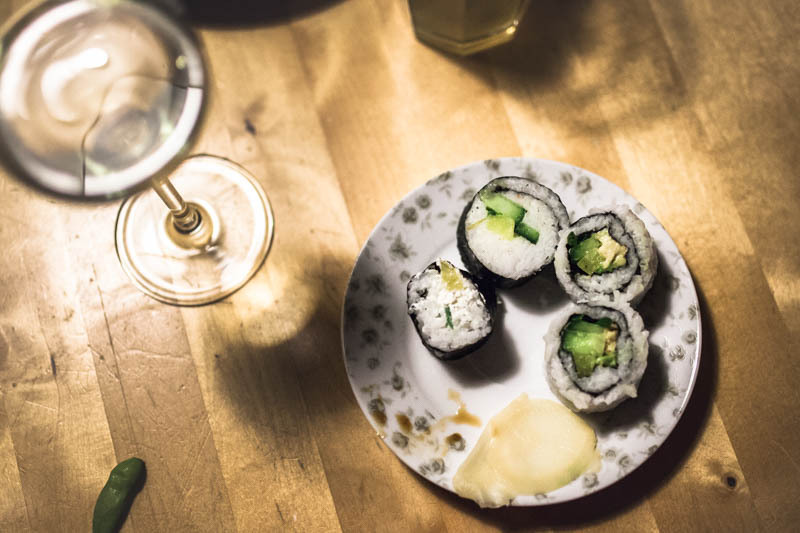 Generally you should have all the sushi basics and tools at home already. Possibly the most important and complicated thing when making sushi. 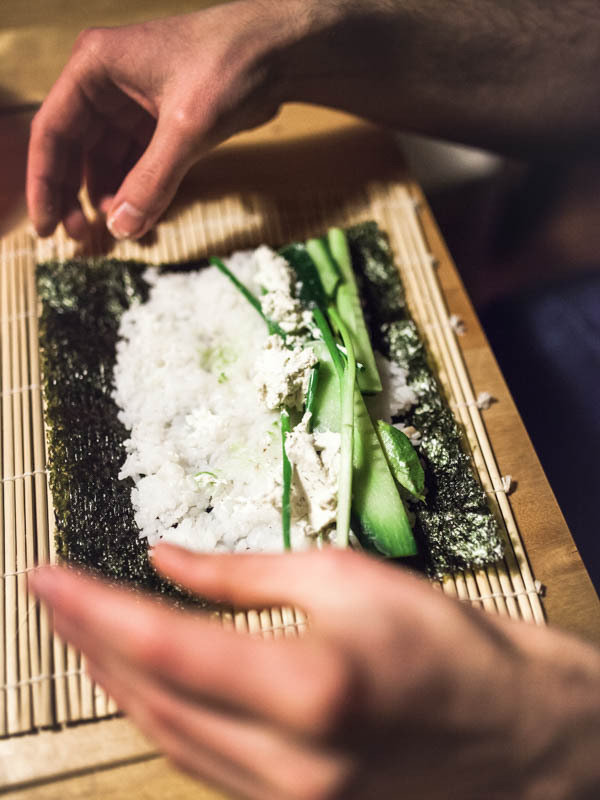 Cooking sushi rice is an art for itself and sushi chefs spend years and years perfecting it. Well, neither I nor you have time for that – but don’t worry we’ll make the best of it and get as close to perfect sushi rice as possible. The perfect sushi rice should be sticky enough that the rolls don’t fall apart but also airy and fluffy. Nobody likes clabbery, mashed rice. Therefore it’s important that you rinse the rice in cold water until it remains clear. I usually rinse my rice 4 to 5 times. If you are very good you can soak the rice in cold water for some hours before cooking is. By rinsing and / or soaking the rice you’re washing out excess starch which results in less squishy (but still sticky enough) and fluffy rice. I usually prepare my rice a couple of hours before I want to make sushi. Yet you can also prepare sushi rice and evening before you process it. When doing that I’d store the rice in a glass bowl at room temperature and only cover it with a lid or cling foil when it has cooled down. Storing it in the fridge will make the rice lumpy and harder work with. Remember, you’ll always eat more when in company. So the following numbers are rough estimates what an average person would or could eat. It also depends on the types of fillings. Raw vegan fillings won’t leave you as full as heavy sauces, cream cheese or meat and fish sushi rolls. If you’re serving starters and sides you should reduce the amount of rice as well. 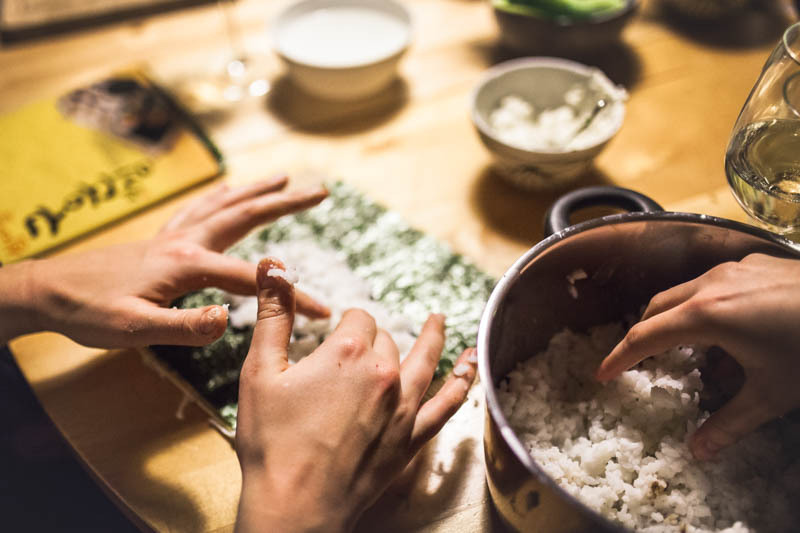 When making sushi for two I usually use 200 – 250g of cooked rice – 200g being 1 cup of rice. We usually have a miso soup or a little salad as a side. For our sushi party I cooked the ridiculously large amount of 1,5kg of rice. We were 7 big eaters plus 3 late-comers. We also packed some doggie bags for another 2-3 friends. Consequently I’m confident that 1kg would have been more than enough for a group of 7 – 10 persons. 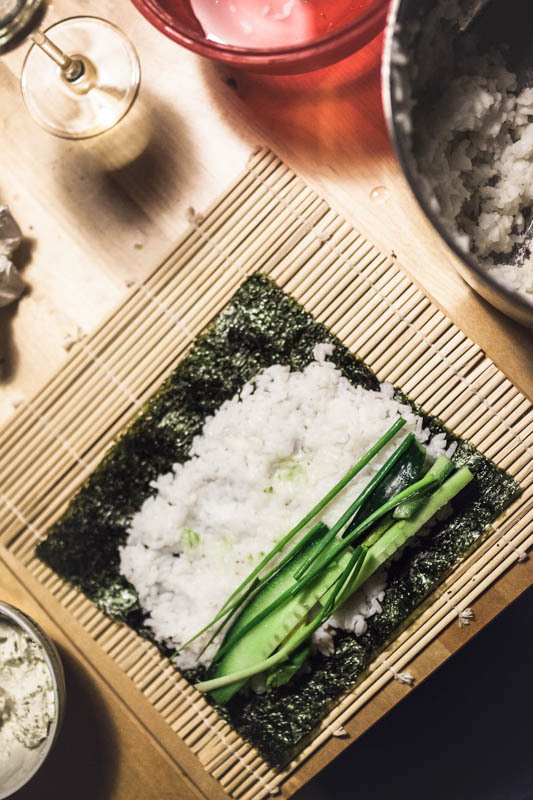 Rinse the rice – I use jasmine rice or sushi rice - until the water stays clear. For rinsing I use a pot, fill it with water, stir the rice a little while, then pour it out and repeat this step 3-5 times. Add 1 part rice and 2 parts water to a pot and bring it to a boil. As soon as the water is boiling turn off the stove and do NOT remove the lid (if the pot is overboiling simply remove it from the hot stove for a few minutes). Let the rice soak for about 15 minutes. The water should be fully absorbed by the rice after that time. Remove the lid and let the rice sit for another 5 - 10 minutes before transferring it to a wooden or glas bowl. Mix rice vinegar with sugar and salt (you you can even heat it on the stove, but I just take my time and stir it thoroughly). Carefully stir the vinegar mix under the rice. Use a wooden spoon and be very gentle. If you want to feel like a pro use a fan to cool the rice down a little. Otherwise just let it cool down at room temperature. There are countless different kinds of rice out there. But which kinds are best suitable for sushi? Well you always play safe with rice explicitly labelled “Sushi Rice*”. Sushi rice is a short-grain-rice, other kinds are for example paella rice or risotto rice and they are all great to make sushi. Yet, I’m a very experimental person and love using other kinds of rice for sushi as well. Since I always have Jasmine rice* at home, a fragrant rice, I usually use this kind for my sushi. It’s sticky enough for all the rolls I’ve made so far, it’s easy and quick to cook and has a nice and fluffy texture. 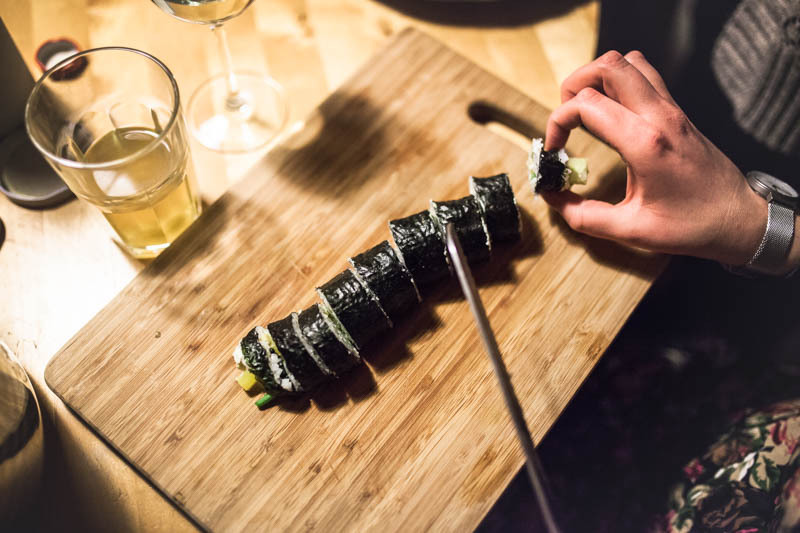 Once you’re a little practised in rolling sushi you might want to think a little more out of the box. I must have used everything rice-ish and grainy that I could find in my supply cabinet as a substitute for sushi rice. Some, like black, purple or red sushi rice are equally sticky and easy to work with. 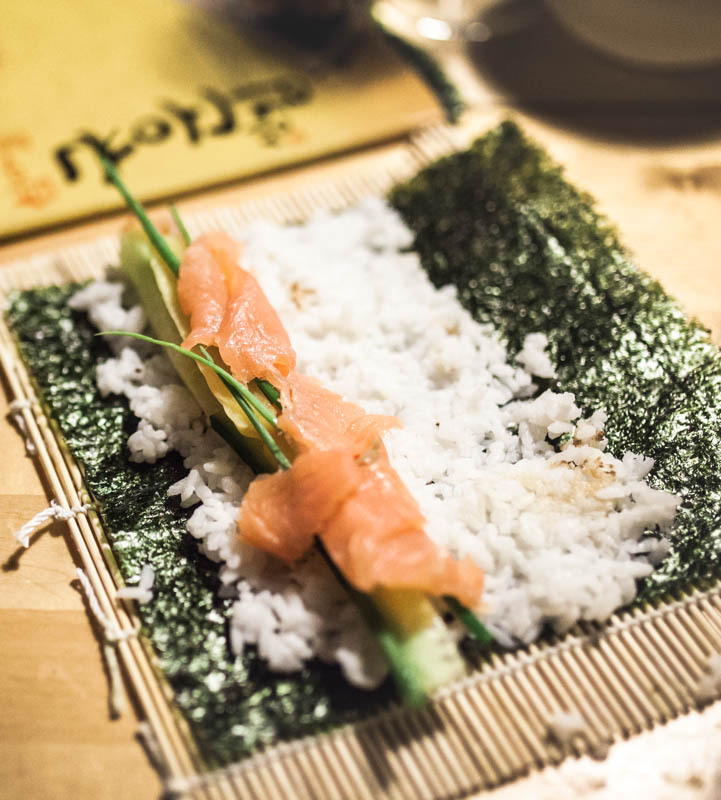 Different colours of rice also give you a lot of room for creativity, such as multi-coloured sushi or the like. 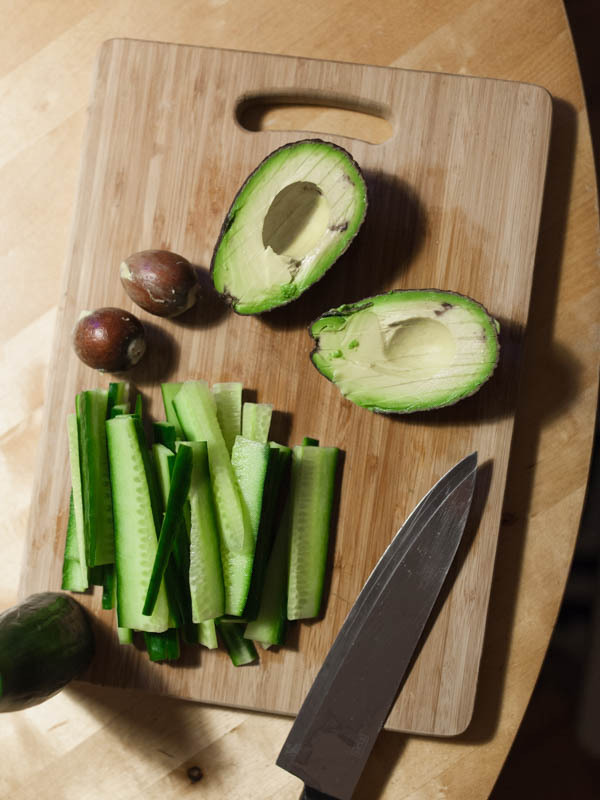 Other foods, like quinoa or couscous are a little harder to work with, since they’re not as sticky and require a little more practice. If you want to go all healthy and cut the carbs the solution is called ‘cauliflower rice‘, which doesn’t taste as weird as it sounds. It’s in fact really delicious and tastes very fresh (and is easy to make). If you have any specific questions don’t hesitate to ask (best in the comments below, so others can benefit from the answer as well).